In 2014, we put the fossil fuel industry on notice. 350.org was involved in movement-changing marches, powerful actions against dirty energy projects, and robust divestment campaigns. The climate change movement is not only growing — it’s thriving. 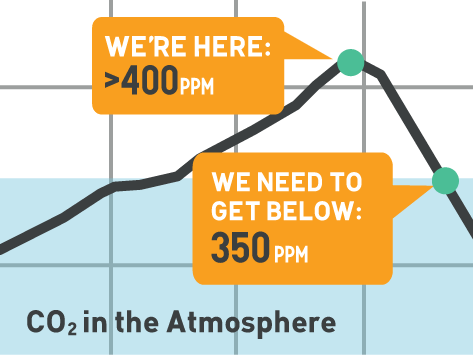 Thanks to your support and involvement, all around the world, 350.org has increased grassroots pressure on leaders to rise to the challenge of the climate crisis. We kept up the pressure on President Barack Obama regarding the Keystone XL pipeline, holding 45 bird-dogging actions and large rallies such as Reject & Protect. In California, Don’t Frack California was one of the largest fracking rallies in history with over 4,000 people surrounding the state capitol in Sacramento. With fossil fuel divestment, we are pressuring state governors in the U.S. to divest state pension funds, and we are urging Pope Francis to divest the Vatican’s holdings from fossil fuels. We are pressuring cities in Europe to divest and banks in Australia from giving loans for fossil fuel projects. We’re actively shifting public opinion through our fossil fuel divestment campaign, which continues to grow faster than any previous divestment campaign in history. Its central purpose, to challenge the social license of the fossil fuel industry and to make clear that fossil fuels must stay underground, is becoming a mainstream demand. The campaign for divestment has led to institutions, local governments and individuals to pledge to divest over $50 billion USD in assets from the fossil fuel industry. We have been training activists on campuses and in institutions to scale up their divestment work. We’re also seeing the young leaders we trained through our Global Power Shift (GPS) program in 2013 put their skills to the test. We helped these young activists organize 86 national power shift events in 31 countries where they trained and organized more young people across their own country. The GPS Philippines organizer was invited to meet with the country’s president, the group in Vanuatu played a crucial role in Cyclone Pam recovery, and many GPS participants planned People’s Climate March events in their countries. Many of these groups are now taking on divestment or pressuring leaders in advance of UN climate talks later this year. Our fights against tar sands, fracking, and coal development are far from over. These iconic fights are reinforcing the narrative to leave carbon in the ground and challenging the premise that fossil fuel infrastructure projects can be built anywhere without massive grassroots opposition. We’ve been fighting dirty energy projects and supporting local efforts that meet the needs of affected people around the world. From pushing back on pipelines in the U.S. (most famously the Keystone XL), opposing fracking in Brazil, organizing divestment campaigns in Europe, to supporting the Pacific Climate Warrior’s coal blockade in Australia; our movement is truly global. With thousands of actions planned by local groups in 2015, we know this is a grassroots effort powered with your help. At the end of the year, we welcomed KC Golden as our new board chair, and created a new role of Senior Advisor for Bill McKibben. KC is a Senior Policy Advisor at Climate Solutions in Seattle, Washington in the U.S. and brings decades of experience, as well as respect for 350.org’s unique ways of operating, to help shepherd 350.org to the next level in years to come. Read on, and take a look at all the work we’ve done together in 2014. Without you, your passion, activism, commitment, and generous support, we couldn’t have had such an amazing year. We look forward to your continued partnership and support in combating climate change in 2015 and beyond. On Sunday, September 21, 2014, we joined allies across the globe to participate in the People’s Climate March. We came together to let world leaders know that there is widespread support for political action on climate and a transformed vision for climate action. With 400,000 people marching in New York City and hundreds of thousands more joining 2,646 events in 162 countries in such cities as London, Sydney, New Delhi, and Sao Paolo, it became the largest climate march in history. Throughout 2014, we held 45 separate actions to pressure President Obama to reject the Keystone XL Pipeline. One of the larger actions was in April, where we helped support the Cowboy-Indian Alliance as they held the Reject & Project rally. On April 26th, thousands of people joined us to demonstrate that the Keystone XL pipeline and the tar sands must be rejected — to protect this, and future generations. Our press outreach garnered media coverage from 83 national outlets, 54 state and regional outlets, and 36 international outlets. Since 2012, 181 institutions and local governments and nearly 700 individuals have pledged to divest from fossil fuels — representing over $50 billion USD in assets. The fossil fuel divestment movement has grown faster than any previous divestment campaign in history. The fossil fuel divestment campaign is now on nearly 450 campuses, and it has spread to cities and churches in the US and in Australia, New Zealand, the UK, The Netherlands, Sweden, Norway, and Germany. Hundreds of local divestment campaigns have been launched on the GoFossilFree.org website, including active campaigns in some of the United States’ largest cities such as New York and Los Angeles. In 2014, we trained over 600 people at workshops across the country, and we held smaller trainings particularly around negotiation. Local groups worked with 350.org staff to pursue a strategy to push state level pension funds, especially CALPERS and NYPERS to pursue divestment. In Europe, the campaign moved very quickly with successes in Sweden, Norway, The Netherlands, and in the United Kingdom where over 40 universities took up the campaign. In New Zealand, the Anglican Church of Aotearoa New Zealand and Polynesia and the Dunedin City Council voted to divest from fossil fuels. In Australia, we pressured big banks such as Westpac, ANZ, NAB, and Commonwealth Bank and encouraged the public to switch banks. 350.org has been playing a supportive role in the ongoing struggle in Mundra, Gujarat where a 4,000 megawatt thermal power plant is being run by TATA power. Owing to the detrimental impacts of the project on local fisherfolks and considering the financial support that the project received from the World Bank (IFC), 350.org worked with allies to put pressure on Dr. Jim Kim, the World Bank President and its functionaries to withdraw its finances on the basis of the various policy and environmental violations that were identified in the project. 350.org Australia, an independent 350 entity and 350.org partner, has been supporting the Maules Creek Coal Mine blockade in New South Wales, Australia. The campaign to stop the Maules Creek Coal Mine is uniting a powerful movement — farmers, city folk, environmental groups, religious leaders and many others — working together to try to stop this dangerous project. On October 17, 2014 The Pacific Climate Warriors, using traditional canoes, paddled into the oncoming path of coal ships in an effort to shut down the world’s biggest coal port for a day. The Pacific Climate Warriors and allies blocked access for coal ships to leave the Newcastle harbor. While Brazil will eventually have to move Petrobras away from fossil fuels, our priority has been to stop fracking from gaining a foothold in the country. We have been building coalitions to strengthen the campaign, which already successfully changed the legislation of 54 municipalities and blocked development in three states through legal measures. Youth activists who were trained in Istanbul at 350.org’s Global Power Shift event in June 2013 returned home to hold 86 national and regional Power Shift summits to recruit and train the top youth climate activists from across their country. These campaigns were a little different in each country, but many of the plans incorporated some form of training and capacity building for climate activists. From planning actions, fighting fracking, launching new partnerships, to fostering leadership through activism, our GPS program enhanced the capacity of our regional organizers to support more activists engaging in bigger and bolder campaigns. Power Shift Nepal, whose coordinators first attended the Global Power Shift training in 2013, have since grown to a group of over 100 young people. Under the platform of “I am a Powershifter”, Power Shift Nepal has set goals to pressure their leaders as well as educate others in order to change the mindset of Nepalese society. We could not do this work without financial contributions, so our immense thanks goes out to the thousands of supporters around the world who have made donations to strengthen our ability to work with and for the movement on climate change. Our staff has grown to keep up with this growing movement, but we are lean and frugal, and strive to make every donation count.